What is rooter services​? Sounds like a plant job or something right? Well, it's closely related. 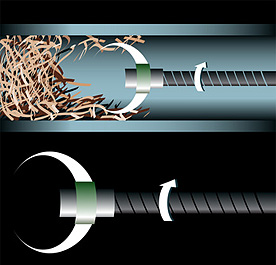 Rooter plumbing originated when roots of plants would make its way into plumbing pipes causing the drainage to back up. This problem, although not as common as in the past, still persists more so in older buildings and houses. Roots of plants will sneakingly grow into the invisible seams of piping and plumbing blocking the drain flow of toilets, sinks, showers, bathtubs, etc. What to do when you have roots growing into your plumbing pipes? First off, don't worry, this is common as I've mentioned above. Common enough that the national plumbing and drain service chain Roto Rooter named themselves that after this very problem. No, you don't need to reconstruct, renovate, or change out your plumbing pipes. So don't worry. But it will be great idea of getting an expert plumber to fix your root problem and prevent the problem from occurring again. Why us over the national chain? Well, because we are a local Hawaii company that will serve you on a level of Aloha! Same expertise (maybe even better) with the Aloha mentality! For residential and/or commercial rooter service needs, emergency or not, call us at (808) 518-6808 and we'll get your roots our of your drains!